I propose a different winner take all system, at least for this year. Given the extraordinary quality of ALL of the remaining GOP candidates (and those who have dropped out or never even quite got in), those left should pledge to make all of the remaining competitors a vital part of their management team once they beat Obama. The winner takes all of them with him to the White House. No more appointing unknown individuals--unknown-until-Glenn-Beck-exposes-them-as-Marxists—to powerful positions running (or destroying) this great once-in-the-history-of-mankind country! Still others could add to this powerful team--Sarah Palin, Bobby Jindal, John Bolton and others. 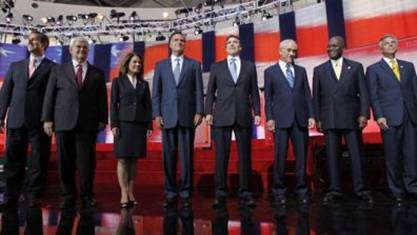 The Nation sorely needs such a “dream team” to restore America from the wreckage left by the Obama-Reid-Pelosi nightmare. No more milquetoast support for the GOP candidate like in 2008: Most importantly, such an approach would solidify and virtually guarantee that the winner takes all of the various candidates’ constituents enthusiastically into the November general election battle. If the GOP is serious about regime change in America, a genuinely united GOP battling mightily to save the United States, the Constitution, the States’ rights, and the self-evident truths identified in the Declaration is the most powerful way to accomplish this.